20 major planets and moons to know about from our Solar System, in a small fun online game. 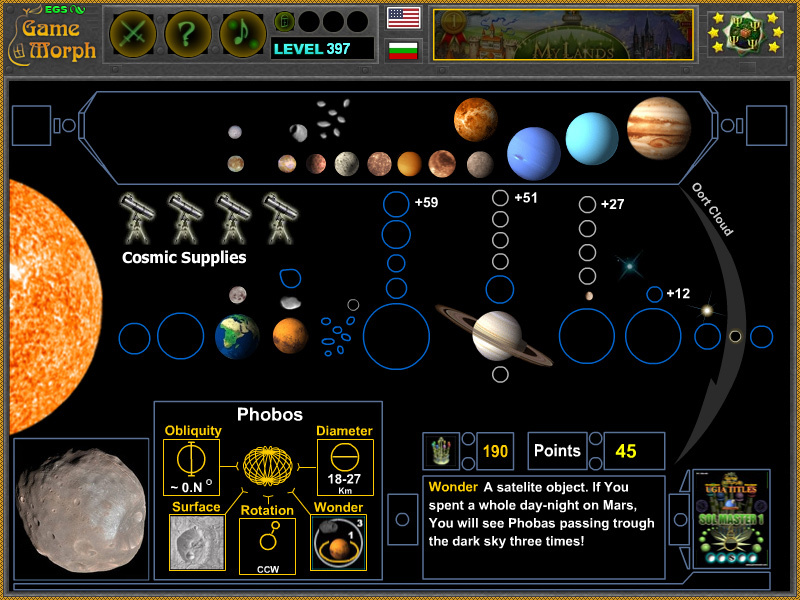 "Solar Puzzle" is a free online knowledge level game about the Solar System. It is part of the Interactive Astronomy Observatory, to explore and study the 9 main planets of our solar system, plus latest discoveries about new planets, like Sedna and other coming soon from the Oort cloud(according to latest discoveries), and some notable satellites or moons. This fun educational application is a short flash game, which will run on medium class desktop computers, laptops and tablets, and reward the player with a new knowledge level, right in the web browser. 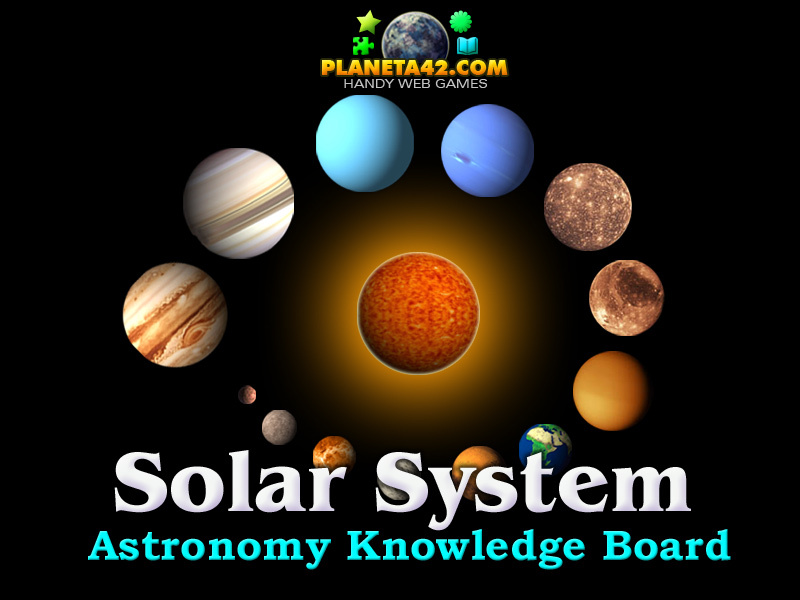 The Astronomy Knowledge Board include 20 pieces of movable planet pictures to play with. Interactive Astronomy Observatory educational tools. Which is the biggest planet in the Solar system? What is the most exciting discovery about Europa? Which planet does Europa moon orbits? Where is Mercury planet situated? Where is Jupiter planet situated? How many moons are there it the Solar System? Which is the smallest moon in the Solar system? Is there an asteroid ring in the Solar System? Which is the biggest object in the asteroid belt? Why Venus have no atmosphere? Which is the biggest gas giant in Sol? How to play Solar Puzzle. Drag and drop the planet pictures, located top of the screen, to the outlines of the planet, in the middle. There were 5 Cosmic Supplies, that would be subtracted on wrong drop. will return on place, until all placed correctly. Know the planets in the Solar System, their positions, some of their satellites and interesting facts about them. Io, Europa, Saturn, Titan, Uranus, Neptune, Triton, Pluto and Sedna. Ceres, Enceladus, Rhea, Lapetus, Dione, Mimas, Titania, Oberon, Umbriel, Ariel, Miranda, Charon and Haumeia. 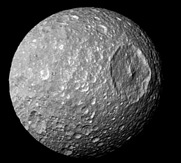 Pictures and references from NASA, Wikipedia and more. Here is our home solar system. In the center, there is the Sun, a red dwarf star, composed mainly of hydrogen and helium. The number of planets rotaitng around the sun is variable, as there are a lot of objects in the Oort Cloud. There are 8 notable planets, one double dwarf planet Pluto, a candidate from the Oort Cloud, a candidate from the Asteroid Ring, and one large minor planet from the outer reaches of the Solar System - Sedna. So in this game, there are 12 planets to know. 1. The first one, the closest to the Sun, is Mercury. It have the shortest year of all planets, which is equal to 88 Earth days. But its own rotation is by far very slow. It takes 58 days for Mercury to turn around itself once. In other words, one year on Mercury is almost one day there too. This slow rotation makes another interesting event. Facing the sun for a long period, makes the planet very hot on one side, and extreme cold on the other shaded side. Mercury is heavily cratered, which means there is no geological activity there. When something hit the surface, the scar remain for millions of years. A lot of the craters have been named, and some of them may be explored with the fun astronomy game Mercury Craters. 2. The second planet is Venus. It is often represented in red color, and refered with love. Its distance from the Sun is almost in the sweet spot, like Earth, making it suitable for life. So why there is not life there? Well, may be Venus did have life, but it was destroyed due to a runaway greenhouse effect. What is most bizarre about Venus, is that it is the only planet in the Solar System, to rotates clockwise. The reason for this may by a hit by another space object, which have changed its rotation. Venus also have the longest day of all planets - 243 Earth days. 3. The third planet is the Earth, our home planet. Its distance from the Sun, not very hot, not very cold, the available water, and the iron core magnetic field(the shield against Sun radiation), makes it a perfect place for carbon based live forms to thrive. In the long run its fate may be the same as Venus, but this is in milion years. Our civilization there is only ~10-20 000 years old, and just 2 000 years advanced. So what will happen in the next 1000 years is also interesting. The Earth also have one natural satellite - the Moon. The moon is orbiting around with one side always facing at the Earth. So from here, we always see only one side and the other side is a secret for the Earth's telescopes. Bun not for the space probes sent there. The moon is also getting far end far from us. One day we may lost in in space. According to one theory, the Moon is part of Earth body, torn by another object collision millions of years ago. So imagine first days of Moon's birth. How close it was to the Earth surface and what beautiful sight it would have been. 4. The forth planet is Mars. The desolate orange planet referred in many folklore. It is one of the most explored planets, as its atmosphere is not very violent. Here is a fun astronomy game with some of the Missions to Mars. There are those sandstorms there, but nothing compared to the volcanoes of Io. Mars is the logical candidate for life birth, when the sweet spot changes with the growing sun after millions of years. But for now, it is just object of speculations and explorations. Mars have 2 moons. But they are not planets, just some pieces of rocks captured in its orbit. First one is Deimos. It is probably part of the asteroid belt, detached from the hive. The other one is Phobos. If we spent one day on Mars, we will see Phobos passing through the skies 3 times. 5. Here goes the Asteroid Belt. 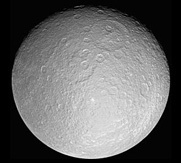 It is not considered a planet and often is neglected when studying the Solar system. The asteroid belt is a living example, how a planet failed to form in its natural way. The reason is believed to be the huge gravity of Jupiter. There is one notable dwarf planet in the asteroid ring - Ceres is the largest planet having a real round shape. 6. The fifth planet is Jupiter. It is a gas giant and is the biggest planet of all in the Solar system. As it sounds, gas giants are mainly composed by gases. And only the core consist of rock or ice. Jupiter also play very important role for the life on Earth. With its huge gravity, it attracts space travelling objects, and do not allow them to reach other planets. Like all gas giants, Jupiter have a lot of moons. 67 objects are circling around it, and some of them are well developed planets, like Io, Europa, Ganymede and Callisto. All jupiter moons and interesting things about them are separated in another astronomy game Jupiter Moons. 7. The sixth planet is Saturn. Another gas giant famous with its visible ring of space objects moving around. It is 24 times bigger than Earth and have 62 natural satellites, some of them very small in size. One of its biggest moons is Titan. And all moons may be explored with the Saturn Moons astronomy game. 8. The seventh planets is Uranus. A pale blue gas giant, 10 times bigger than Earth. What is most odd about Uranus, is that its axis of rotation is approximately parallel with the plane of the Solar System. In other words, it rotates around itself like top-down, and not like the rest of the planets left - right. Uranus have 27 natural satellites. The most notable one is Titan, the second largest moon in the system. And all moons may be explored with the Uranus Moons astronomy game. 9. The eighth planet is Neptune. An ocean blue gas giant with almost the same size as Uranus. One year on Neptune is 164 Earth years. It has 14 known moons, the most notable is Triton. And this is the point where Heliosphere ends. The rest of the planets are called trans-Neptunian objects and are at a great distance from the Sun. Also their orbits are so elliptical, that they may appear in or out of the Oort Cloud. They are caught in the Sun's orbit in a range called Interstellar Space. And Neptunian moons may be explored with the Neptune Moons astronomy game. 10. The ninth planet is Pluto. It is double dwarf planet, as the latest discoveries show, that Pluto have a brother planet Charon. Pluto and Charon are considered a binary system because the barycenter of their orbits does not lie within either body. This means that they both looks like circling each other, seen in the Meet Pluto game. Pluto have another 4 moons - Styx, Nix, Kerberos and Hydra. 11. The tenth planet, considered in this fun astronomy game is the dwarf planet Haumea. The planet has an ellipsoid shape and even have 2 moons - Hiiaka and Namaka. 12. The far most planet is Sedna. It is a minor dwarf planet in the outer reaches of the Solar System. Little is still confirmed about where did this planet came from, or how was formed. Some of those distant space objects may as well be satellites for some of the gas giants. It takes a lot of years to see where actually one orbit leads, as some of them need more than 100 years to complete one side cycle. For Sedna, "she" goes one time around the sun, for 12 000 years! So this planet haven't completed even one cycle, while human have evolved from iron age, to modern times. All of this exciting story is compiled in the Solar Puzzle game, in a short astronomy knowledge application, with a lot of pictures and less text. Labels: Space Games , Games with Planets , Puzzle Games , Flash Games , Astronomy Games , Education Games , Free Online Games.